Video in Print: What it can do? Maybe you have already heard about videos that can be integrated into print via specific techniques. They offer a powerful multisensory experience. But video-in-print has so many other advantages too: You can deliver more information to your target audience, and you can present arguments for your product in a more convincing way. Additionally, marketing material which is that complex creates a certain “value feeling” with the recipient. Because there are so many advantages, more and more companies use marketing materials that combine that advantages of video and print. And this is why you should make sure that you’re only telling the best possible stories! Storytelling in videos is possible in different ways. The main thing is though that you’re creative about your video content. Give your target audience, your customers and potential customers the feeling that they are part of the story of your brand. Don’t present what you want to tell, talk about what your target audience is interested in and moved by. If you manage to find the right voice for your brand, your company and its values, it will result in loyal customers that come back. But it’s not enough to just create a video and publish it online or even include it into a printed brochure. If you want to lead your target audience to a specific site or to motivate them to buy your product you should make use of the potential of video marketing. It’s also important that you pick the right metadata and tags and that the title is interesting and engaging – only then your print-video will turn into a success. We all know that we can reach more with two things than with one. So how is it with three things? 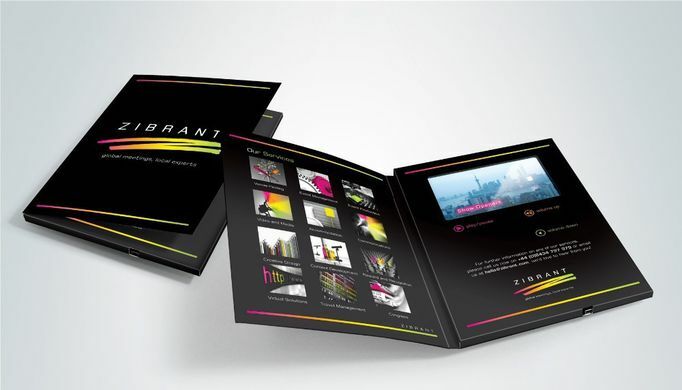 With video-in-print-brochures you address visual sense, sense of touch and sense of hearing – all at once! That way, you offer lots of contact points to your target audience. And they feel like they have plenty of options to get in touch with your brand. Usually, consumers get influenced by other customers reviews. But they also look for product videos. Because we all want to know how that one product that we want to buy works, how it looks when it is put to use. In video marketing, the golden rule is: content needs to be presented short and engaging and it needs to be accompanied by a call-to-action. If you keep this in mind and complete your videos with printed material you have an unbeatable marketing instrument at your fingertips. Are you already in the middle of video marketing? If not, it is about time you start! B.Moss helps you create perfect video-in-print-materials and makes sure that your target audience will remember you. Contact us here or get inspired by our product selection! Say hello to our Print-Pop-Up of the week!